Location of Djibouti. Source: CIA World Factbook. On December 21, around the time that half the world was busy decking the halls with boughs of holy, in the small and hidden African country of Djibouti, up to nineteen people were shot down in the street by the government’s security forces. According to Voice of America, troops targeted the commemoration of a late religious leader that had been very influential among the nation’s opposition circles. Indeed, a leading opposition figure, Ahmed Yusuf, was wounded in the raid, along with an opposition MP and dozens of civilians. The United States State Department issued a statement urging restraint and respect of the freedom of speech by the government, but it remains to be seen whether Washington’s appeals will fall on receptive ears. What’s more, the attacks come at a delicate time, as Djibouti is slated to hold a crucial presidential election later this year, in April. Nestled up against the Red Sea, Djibouti is a little bigger than the US state of New Jersey, and shares land borders with Eritrea, Ethiopia, and Somalia. Formerly a part of the Land of Punt, Djibouti voted its way to independence from its French colonial masters in 1977. It’s the home of about 800,000 people, mostly Muslim, and, though multi-ethnic, it is relatively free from conflicts among those groups, thanks in part to the autocratic regime of incumbent president Ismail Omar Guelleh. A recent expose written by the Daily Beast’s Tim Mak paints a harrowing image of a country exploited by a venal political class at the expense of an oppressed population. Initially elected to the presidency in 1999, Guelleh is seen by many as a run-of-the-mill tyrant, crushing opposition and consolidating power as he goes. When Djibouti found itself caught up in the Arab Spring of 2011, Guelleh’s henchmen quickly and harshly put down the protests, and Guelleh won a controversial election boycotted by opposition parties whose candidates were twice jailed prior to polling. Predictably, the aging Guelleh announced late last year that he intends to run for a fourth consecutive term. 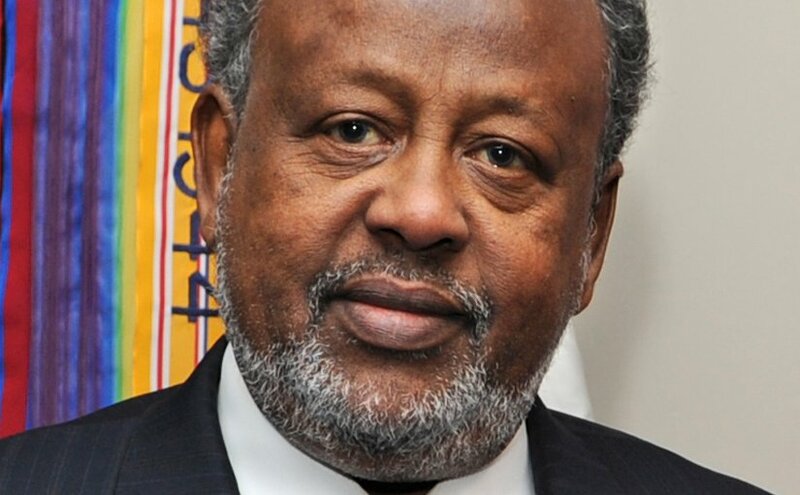 Djibouti’s Ismaïl Omar Guelleh. Photo by Robert D. Ward, US Government, Wikipedia Commons. Unlike other African strongmen that have been on the receiving end of Western criticism, Djibouti’s Guelleh was largely spared. Why? Because the small African country has deftly leveraged its single strength, its strategic location at the mouth of the Red Sea, to cram the armies of seven militaries on its shores. Japan has its only post-World War II military base there, the French still maintain a military presence, and so do the Americans, Italians, Germans, Spanish, and soon the Chinese. Arguably the most important and only US military base in Africa, Camp Lemonnier, is located on a spot first used by the French Foreign Legion. Refurbished after the al-Qaeda attacks on the United States in 2001, the site is now a Naval Expeditionary Base and is used as a staging area in the US’s War on Terror. Situated on the south side of the Djibouti-Ambouli International Airport, the US is responsible for 30,000 takeoffs and landings per year, which is roughly half the airport’s total traffic. The US government pays around US$70 million per year to use the facility – which is almost as dangerous for US personnel as is running against Guelleh. As detailed in a Washington Post investigation, the air traffic control situation is an unmitigated disaster. Controllers sleep while on duty, become engrossed in their cellphones while pilots communicate with them, and “punish” pilots they deem disrespectful by putting them in holding patterns until they run low on fuel. The US government tried to retrain the Djibouti air traffic controllers a few years ago, spending US$7 million in the process. Ultimately the Djiboutians stopped going to the classes and locked the American trainers out of the tower. With elections coming up in April, the regime of Ismaïl Omar Guelleh is undoubtedly making sure that copious amounts of khat are on hand. However, as December’s clashes show, the people’s desire for freedom and liberation from tyranny can’t be completely shut out, either by force or by khat. Get your facts straight! Djibouti was part of Ethiopia leased to the French for 99 years by King Minilik in exchange for railroad construction.